I love fonts. It is amazing and wondrous to me how you can make so many variations from 26 letters and 10 numbers. They are so emotive or they can be. There are serif fonts (they have the little feet on them), san serif fonts (without the feet), display fonts (specialized to be used at large sizes and to grab attention to your headlines), script and/or handwriting fonts (can be used to give a casual, friendly feeling to your message). There are multiple subcategories in each of these. There are also pi fonts (also called dingbats). These can be very helpful in creating a quick message. 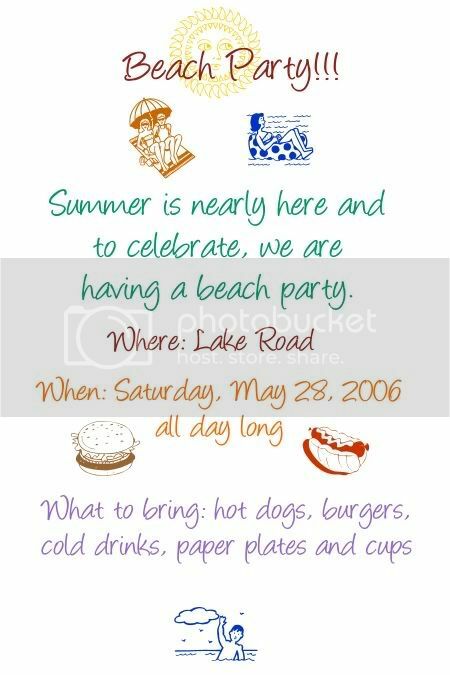 For instance, say I am creating a quick card to invite some friends to a cookout by the lake. I want my card to be friendly and casual, so I am looking for a handwritten looking font. A good place to look is DaFont. You might have to choose English or French language. On their index page is a list of types of fonts. I am looking under Script/Handwritten. I start looking in the A section and right away, I see Angelina. That is exactly the look I want. So I download and unzip it. I install it in my Fonts folder. If anyone doesn't know how to do this, I will cover this next time. Continuing on, back to the index page of Dafonts.com. I look under Dingbats/Various and I find a great font called Culinary Art by GemFonts. I download that one. Then I choose one called 4YeoSummer because it has some great dings of summery things. Download and install those. Oh, there is something you can do if you don't want to install these. Once you have extracted them, you can open them with your font viewer by clicking on them,now just minimize them to your taskbar. When you open your graphics software, it will recognize them as if they had been installed. I am going to use Macromedia/Adobe Fireworks to put this together although you could use any graphics app and probably even Word *shudders*. Here is a quick invitation that I came up with. I used the 4YeoSummer dingbats: G for the couple under the umbrella, J for the woman on the floatie, P for the sun behind "Beach Party" and K for the boy waving on the bottom. I used Culinary Arts: B for the burger and U for the hot dog. Then I wrote the invitation in our font, Angelina. I am not espousing this as design but just wanted to show a quick and fun way to use different kinds of fonts and dings. My name is TGG, and I'm a fontaholic. I have like a thousand fonts. It's ridiculous. Do you know how long it takes to Photoshop to open when it has to process that many fonts? I do! I can't seem to bring myself to delete any of them. Yes, someday I KNOW I will use all 20 different versions of the X-Files typewriter style font that I collected back during my XF fandom. I just KNOW it! I have even have a naughty one that I KNOW I will never use. NEVER! And yet, there it sits. Is there a support group for this? I'm addicted to the Angelina font since I found it a few months back. I use it way too much, I keep forcing myself to use another font, but I go back to it too often. Thanks for the link. I don't know how to add fonts. I can get a spacecraft into orbit, but add fonts? Don't know how! Must.learn.now!